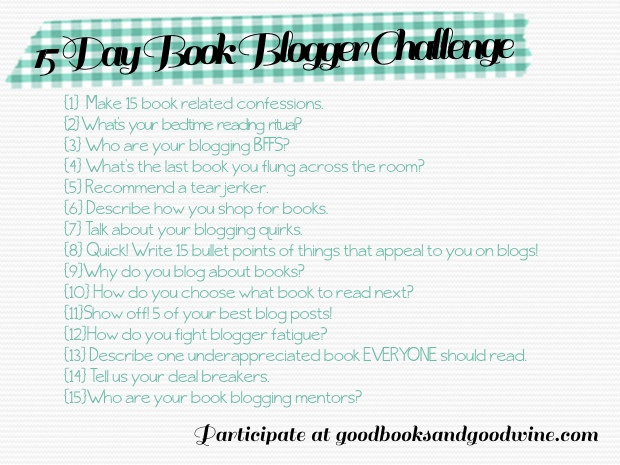 Today, I'm wrapping up the 15 Day Book Blogger Challenge (started by April at Good Books and Good Wine), which actually took me about 3.5 weeks -- but I didn't give up on it! The final topic of discussion: Who are your book blogging mentors? My first blogging mentor would have to be Ashley (Nose Graze). Ashley started her blog in 2012, which wasn't that long ago, and she has such professionalism and is so reputable. I met her at BEA 2013 while in line for Gretchen McNeil's 3:59 (review here) and was so sweet and kind. And just the other day, I had some questions for her and from several time zones away, she was still willing and able to help! Even if I'm not asking her questions, I make sure to read her blog every single day. Besides the every day ins and outs of blogging, she's also a really accomplished graphic design with great coding skills, and she posts about all kinds of things of that nature, so her blog is always there to answer common questions. My second blogging mentor would be Eileen Li (Singing and Reading in the Rain). Eileen and I also met at BEA and she is a good friend of Ashley's. When I met her, she offered me a chocolate chip cookie. I spent almost the entire day with Eileen and Ashley and it wasn't until I was almost done for the day that I realized she was only 13 (at that point). She carries herself with such poise and grace and is extremely knowledgeable! She's always responsive, always helpful, and made me feel like I wasn't an outsider as a new blogger. She's super sweet and driven! My final blogging mentor would be someone who doesn't directly mentor me or even know me, but I've been reading her blog for forever and when I was getting ready to go to BEA, I read her tips about it from her previous visits and it made me feel so at ease. She's gracious in sharing her knowledge and tricks of the trade. That's Kristi (The Story Siren)! I love reading her blog and I think all of her advice is really great!